This edition of You Can Conquer Cancer is completely updated. It contains whole sections which provide important new information and self-help techniques. 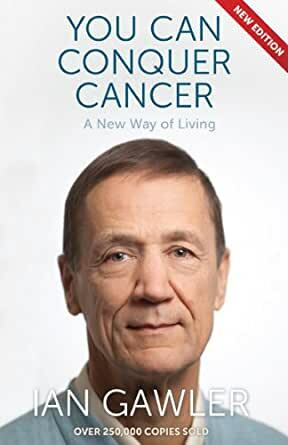 The book, remarkable for its clarity, enlarges upon what is a truly integrated, holistic approach to cancer; emphasising nutrition, the power of the mind, meditation, family and social support and the spiritual dimension of life. A revolutionary book when it was first published in 1984 has sold 250,000 copies worldwide and been translated into fourteen languages. It has become a classic and one of the most widely read books on the subject of cancer management and survival. A good read, particularly the meditation sections. I first read this book in the late 1980’s when my cousin was undergoing treatment for breast cancer. She had attendede a program run by the author, Ian Gawler, and was following the lifestyle changes outlined in the book. I was interested in what she was doing and so bought the book. Many years later in 2004, the book was sitting on my shelf when I was diagnosed with non-Hodgkin’s lymphoma. My diagnosis was a huge shock, but knowing that “there was something else out there” that I could do to help myself was very empowering and was a huge boost to my confidence at a very difficult time. I bought the latest edition of the book and devoured it; using it to support the treatment that I was having through my specialist. I learnt to meditate, reassessed the priorities in my life and paid great attention to what I was eating and drinking. Under the guidance of the book I took ownership of my health and healing and of my life as a whole. I now give this book to friends, family and acquaintances upon a cancer diagnosis. I found it to be life-changing and I want to share the wisdom and hope with others, especially at that vulnerable stage following a cancer diagnosis. I highly recommend the book to anyone facing, or caring for someone, with cancer. However, the contents are so clearly outlined and so easily digestible that I feel that the book is just as pertinent for anyone who wishes to reassess and turn their life around with or without a current health challenge. 5.0 out of 5 starsA profoundly important and life-saving book with PRACTICAL IDEAS!!! inner strength when my world imploded. A profoundly important and life-saving book with PRACTICAL IDEAS!!!! The first port of call for anyone with a cancer diagnosis. Over the past 12 years, I have had four major cancer ops (Prostate, Bowel re-section, Lymphoma and Liver) I have been in remission for seven years now and it is because of my positive attitude, getting on with life and a full happy lifestyle with my wife and family members (especially grandchildren) and friends, that has got me through it all. Also my cancer/s were found in the early stages so this is a major issue in how I survived. I found this book to be very similar, in many ways, as to how I have been able to get through my operations, (as well as having top doctors who operated on me), and this attitude has allowed me to advise and help others who were going through their anguish on having been diagnosed with cancer. A good read for anyone looking for some guidance and answers on how to cope. It can be done and make sure you have regular check-ups. I read this book when first diagnosed with Cancer and it made so much sense. I then attended the Gawler Foundation Cancer Retreat in The Yarra Valley and is was amazing. His book has become my guide for living with cancer. I am now 18 months on and doing well. I bought his original version and this latest version has updated info and well worth while. I would recommend it to anyone diagnosed or their support crew ,family or friends and if you can get to any of his retreats do so--- you come away filled with hope,peace and choice. This book is full of practical, helpful and encouraging suggestions and information. Ian Gawler's seminars and his institute in Australia have the same message as this book about the degree to which you can make a real difference in your health even with as serious an illness as cancer. I have needed to completely change my diet for different health reasons and it worked. As a psychologist I know what a difference your own mind and beliefs makes to your health - the decision is yours whether you make your life everything it can be or hope that someone / something else will. This book shows you how to do it if you are going to take care of your life. This is a must read for anyone going through cancer or in fact any chronic illness. Everything is simply explained with exercises and examples which are easy to understand. I am enjoying the book slowly and trying to practice what I read. It has given me tremendous hope in my personal fight against cancer. I would recommend this book to everyone. Thanks to Ian Gawler. I think Ian is comprehensive, in covering what changes people need to make, to beat cancer. The book could be better organised and made simpler for less literate people. For example, the information on diet could be grouped more compactly in one chapter. I use this book as a guide for living, which is what I intend to do !